Jack LaLanne's Physical Conditioning: Source: www.gamescollection.itAs I'm sure you've heard by now, fitness icon and all around good guy, Jack LaLanne, died yesterday at the age of 96. LaLanne had an incredible career and was one of the true fitness pioneers, establishing the first major television fitness program in the 1950s, helping to spread the word on the immense benefits a healthy, active lifestyle can bring ever since. What you may not know is that among his laundry list of accomplishments, he lent his potent brand to the first ever exer-game, Jack LaLanne's Physical Conditioning, which was created in 1980 for Mattel's Keyboard Component add-on for the Intellivision. Unfortunately for the exer-gaming cause, the Keyboard Component only saw an extremely limited release before being pulled from the market and few of the 4,000 units produced remain in collectors' hands today. As with most of the rest of the Keyboard Component-specific software, precious few of the Jack LaLanne's Physical Conditioning cassette tapes remain. 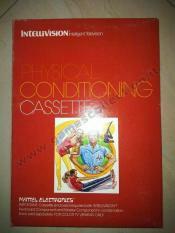 Jack LaLanne's Physical Conditioning took advantage of the Keyboard Component cassette deck's impressive ability to synchronize both data and pre-recorded voice (this underrated feature was on a few other systems of the day, including the APF Imagination Machine and Atari 8-bit). As the graphical represenation of LaLanne would demonstrate each exercise, LaLanne's own voice would give instructions. Original music and sound effects from the system would also play. This was a wonderful way to bring a more interactive version of LaLanne's long running TV show into homes, and easily predated the videotape exercise craze started by Jane Fonda's Workout in 1982, and the next major exer-game in 1984, Spinnaker's Aerobics, for the Atari 8-bit and Commodore 64, which had fewer features and lacked speech. Wii Fitness for Dummies (2010), by Christina and Bill Loguidice, through Wiley. We just finished primary author review on the book, so it's now considered at 100%, though there are still a few minor things to do. Since it's at that point, I'm now able to release what should be the final Table of Contents. Check it out here: http://www.armchairarcade.com/neo/node/3046 . As always, any questions, ask away. We're still looking at a February/March 2010 release. Wii Fitness for Dummies, available from retailers worldwide, is THE book on the Nintendo Wii fitness revolution. Part 1 covers Nintendo's Wii Fit Plus, Part 2 covers EA Sports Active: Personal Trainer from Electronic Arts, and Part 3 covers Majesco's Jillian Michaels Fitness Ultimatum 2010. There are two parts of ten at the back of book, as well, which cover ten Wii fitness accessories, and ten other Wii fitness games, respectively. You'll not only get to know all of the games inside and out, but also learn proper exercise form, theory and methodology to maximize your fitness experience, all in the inimitable friendly and approachable for Dummies style.